Mention Day Trips for 10% off any regularly priced wine purchase at the tasting room. 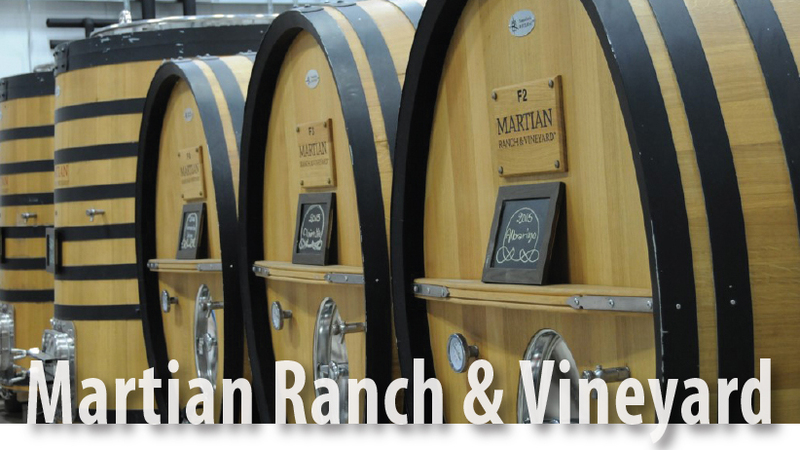 Make your trip to Santa Barbara wine country complete with a visit to Martian Ranch & Vineyard! Located just three miles off Highway 101 and minutes south of the town of Los Alamos, Martian Ranch provides an out-of-this-world experience for guests. The tasting room, which opened in October 2013, features biodynamically-farmed, vibrant wines from Martian Ranch’s estate vineyard. Winery Owner, Nan Helgeland, is the earthly force behind Martian Ranch & Vineyard. Originally from Cape Cod, Nan found her inspiration in the world-class wines produced in Santa Barbara County. She purchased the 102-acre property in 2007 and planted the vineyard in 2008. The first estate wines were bottled from the 2011 vintage. The Martian Ranch tasting room is a fun and comfortable place to enjoy a unique selection of estate wines, each named after a celestial notion, from the Stellar Viognier to Local Group Grenache Noir and Mothership Grenache Blanc. The glass wall behind the tasting bar offers a view of the large Foudre barrels in the wine cellar. Tours of the winery are available upon request. • The name Martian Ranch comes from Nan’s two sons—Martin and Ian—and their combined alien nickname. • In biodynamic farming, each part of the growing process revolves around four elements: root (earth), leaf (water), flower (air) and fruit (fire). Together, these elements create the highest expression of harvest. • Bocce ball court, horseshoe pit, spacious picnic areas and VIP group tastings. Dog friendly!